"Does he call you at two in the morning?" 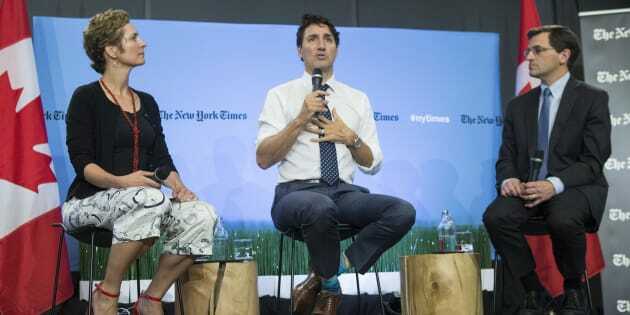 Prime Minister Justin Trudeau sits alongside Peter Baker, Chief White House Correspondent of the New York Times, and Catherine Porter, Toronto Bureau Chief for The New York Times, during a panel discussion in Toronto on June 22, 2017. Prime Minister Justin Trudeau says he has not called Donald Trump on the U.S. president's cellphone, to the best of his knowledge. In a discussion on Canada-U.S. relations with The New York Times in Toronto Thursday, the newspaper's chief White House correspondent Peter Baker asked the PM how often he speaks with Trump. "Does he call you at two in the morning? You have his cellphone. Does your wife know? 'Oh, it's him'," Baker said, scoring laughs from the audience at the University of Toronto's Rotman School of Management. Former and current U.S. officials told The Associated Press last month that Trump has urged Trudeau and Mexico's president to call him directly on his cell, a move that breaches diplomatic protocol and raises security questions. The sources told AP that only Trudeau has taken him up on the offer. But Trudeau said that when he speaks to Trump by phone, "as far as I know it has never been on his cellphone and it's never been on mine." The prime minister conceded that there's less "build up and preparation" for his calls with the current president than there was with Trump's predecessor, Barack Obama, who scheduled discussions days or weeks in advance. "We're always reporting fully on the conversations we have," Trudeau said. Calling Trump a "deal-maker" who keeps promises, the prime minister also lauded him as a good listener — a remark that spurred some chuckles. "No, I can understand the laughter but there's a lot of politicians who have a deep, vested interest in being right all the time and therefore close themselves off sometimes to facts or evidence or differing opinions," Trudeau said. "What I've found from this president is he will listen to arguments made, he will look at the ensemble of facts and proposals of impacts you put together, and he will be open to shifting his position. That's something we can definitely work with." Asked about Trump's penchant for eyebrow-raising tweets, Trudeau replied: "There's no question that the way the president chooses to speak directly to people through social media is a new wrinkle in international diplomacy." He also downplayed the threat that the U.S. could walk away from the North American Free Trade Agreement, saying there is "no need for a Plan B" in case talks to rework the pact fail. The prime minister said he was "100 per cent" certain the trade deal will be intact in a year's time. "NAFTA will remain a hugely important and successful trade deal for both of our countries," he said. 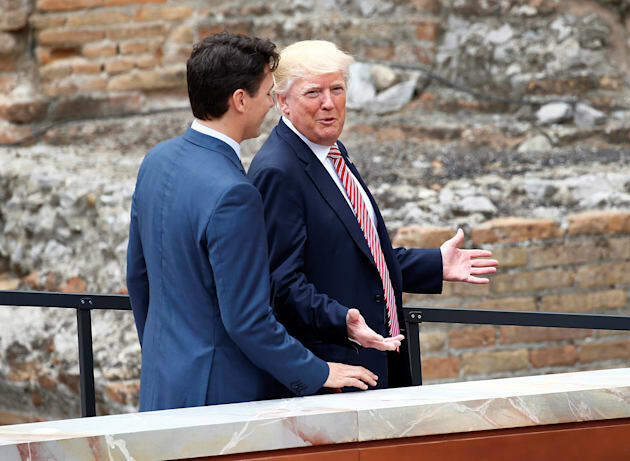 U.S. President Donald Trump and Prime Minister Justin Trudeau talk during the G7 summit in Taormina, Sicily, Italy, May 26, 2017. Trudeau also reiterated he was disappointed in Trump's decision to abandon the Paris climate accord, but said he has not discussed reworking that deal. "We're not reopening and renegotiating Paris, that's simply not on the table. It was an awful lot of work getting to the consensus we did. It's a good deal, it's the right deal, it's the path forward for the world," he said. Trudeau added he was not "overly worried" about the "dip in American leadership" on climate change because there is such global recognition that this is the path forward. The prime minister also heaped some unexpected praise on his chief rivals who are also working to keep close ties with the U.S. in the Trump era. "The other political parties, particularly the Conservative Party of Canada, have been very positive and thoughtful in their engagement with the United States in a way that is constructive and helpful," Trudeau said, adding that he has long believed domestic squabbles should stop at the water's edge. Tories have helped ensure that U.S. officials in different parts of the administration understand Canada is united, even if they are hearing many different voices, he said. "But many voices saying the same things, which has really been helpful as well."